I didn't spot her with a book the first three nights, but by the fourth night when I entered the backstage dressing room to get something, I found her reading while waiting for her play to start. There was considerably less chaos backstage by then, enough for her to get back to her reading, which in this case happens to be They Don't Get It, Do They? by Kathleen Kelley Reardon. Purchased from a flea market. She buys her books secondhand or from the discount bin, since they cost a lot more "fresh from the store." Prefers non-fiction, like self-help, linguistics, or anything to do with gender roles in society. 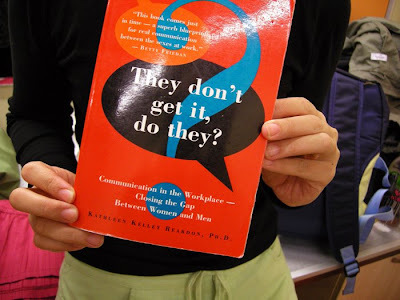 The chapter she's currently reading focuses on how women & men handle intimidating office talk. If she reads in 1-2 sittings, it takes her 2 days to finish a book. But since she squeezes reading into any free time she has, each usually takes 2 weeks.